If you want to block notifications for selected features and receive only those notifications you want to get, then you need to configure Blocking Mode on your phone first. Samsung Galaxy S5 owners may opt to block certain notifications by contact of feature, and likewise select blocking all the time or during a specific period of time. Here's a quick guide for you to configure blocking mode settings on your Galaxy S5 to filter notifications you want to receive on your phone. 3. For you to configure options, tap on the Blocking Mode icon. · ON/OFF switch - Located next to Blocking Mode is the ON/OFF switch. Tap on it to enable the setting or turn it ON. (Do the same thing to disable it.) Please note that you need to turn on blocking mode for you to configure options on your device. · Block incoming calls - If you don't want notifications for incoming calls to display on your phone, just enable this feature. · Turn Off notifications - If you don't want notifications for new messages to display on your phone, just enable this feature. · Turn Off alarm and timer - If you don't want notifications for alarms and timers to display on your phone, just enable this feature. 1. Tap on the check box next to Always. Doing so will block notifications at all times. 2. Disable the Always option by removing the checkmark on the box. Doing so will let you set a specific period of time to block notifications each day. Set a starting time on the From Field and ending time on the To Field. 3. Tap on the time fields and then set the time. 1. Tap on Allowed contacts. 2. Choose whether you prefer to allow notifications for all contacts, just your favorites, or create a custom list. If you choose a custom list option, you will be asked to choose contacts for the list to proceed. 3. 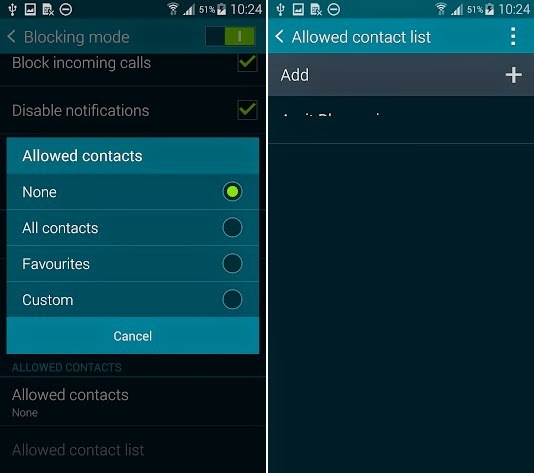 To modify the list of allowed contacts, you can tap on the Allowed Contact List option given you already have created a Custom list of allowed contacts. Note: However, you should remember that this option is only available when the Custom list is turned on or enabled.